From the sweet sounds of Branson, to the cultural amenities of St. Louis and delectable BBQ joints in Kansas City, the Show Me State offers a unique and enjoyable lifestyle for its residents and visitors alike. Regardless of which stage of life Missourians may find themselves, the state has something for everyone. Missouri ranks among the top 20 best states for millennials as well as retirees. The average high in Missouri's summers is 89 degrees, while its winter lows rarely dip below 19 degrees. The entire state offers a low cost of living and has been ranked the sixth for lowest cost of living and the 9th for affordable housing. According to Zillow.com, the median home value in Missouri is $145,000, while the median rent price is $950. The real estate website ranked St. Louis as the No. 5 Most Affordable Market for Homebuyers in the country. With two World-Series-winning baseball teams, the Kansas City Royals and the St. Louis Cardinals, the NFL's Kansas City Chiefs and the National Hockey League's St. Louis Blues, sports fans always have something to cheer about in the Show Me State. Missouri offers top-notch outdoor recreation activities throughout the state. The state park system — which ranks among the top four in the country ­— has more than 150,000 acres and 1,000 miles of trails to explore. Popular pastimes include hiking, climbing, hunting, fishing and other water sports. The breathtakingly beautiful Lake of the Ozarks has more miles of coastline than the state of California. Forest Park, a 1,293-acre park (500 acres larger than New York's Central Park) in St. Louis, has been named the Best City Park in America. The park is home to famous cultural institutions like the St. Louis Zoo, three museums and the Muny Opera. Other popular landmarks include Mark Twain's Boyhood Home and Museum in Hannibal, Meramec Caverns in Stanton, the Pony Express National Museum in St. Joseph and the famed Route 66 which travels more than 280 miles through the state. Kansas City, on the state's western border with Kansas, is a haven for Jazz and BBQ lovers alike. The city's historic Union Station offers several attractions including Science City (a favorite for children) and the Arvin Gottlieb Planetarium. Live music is part-and-parcel for the southern city of Branson, which is home to more than 50 theaters and dozens of live shows – not to mention its abundance of other tourist attractions. Silver Dollar City is an 1880s theme park that's been ranked by Fodor's Travel as One of America's Top 10 Parks and will soon open the world's fastest, steepest and tallest spinning roller coaster. And of course, a visit to Missouri wouldn't be complete without a riverboat cruise down the Mighty Mississippi or seeing St. Louis' skyline from its iconic Gateway Arch first hand. The landmark's newest attraction, The Museum at the Gateway Arch, will open in July 2018 and tell the story of Native Americans' early explorers and pioneers. 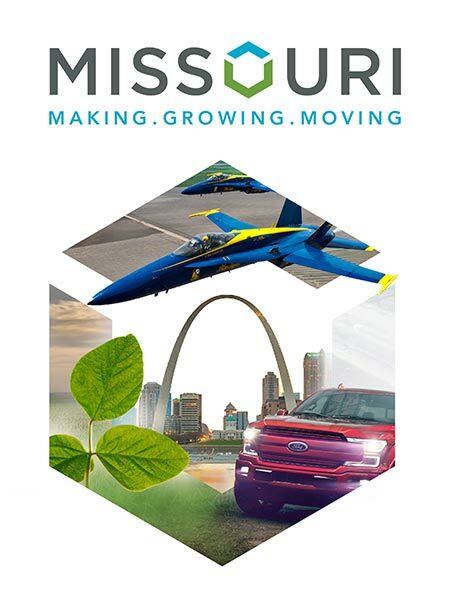 Whether it's in the state's eclectic cities or peaceful countryside, putting down roots in Missouri can only lead to growth.